Employers are required to provide overtime pay when an employee works more than 40 hours in one week, except for those employees who fit within one of the specific exemptions. 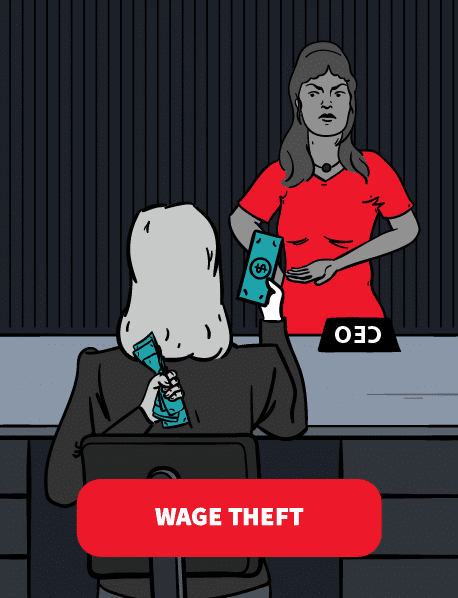 Denying overtime pay is a form of wage theft. Several laws govern overtime in New York state, including the federal Fair Labor Standards Act (FLSA) and New York State Labor Law (NYLL). Penalties include double the amount that should have been paid and up to $10,000 per year in fines. If you have been denied overtime pay, or you have been wrongly classified as an exempt employee, you may have a claim. A New York employment lawyer can help. The overtime laws apply to employers whose annual sales total $500,000 or more, or those who are engaged in interstate commerce. This covers almost all employers because the courts have interpreted the term “interstate commerce” very broadly. For example, courts have ruled that companies that regularly use the U.S. mail to send or receive letters to and from other states are engaged in interstate commerce. Even the fact that employees use company telephones or computers to place or accept interstate business calls or submit or take orders has subjected an employer to the overtime laws. The law requires that employees must be paid one and a half times their regular rate of pay for all hours worked more than 40 hours in any given week. You are not entitled to overtime pay simply because you work more hours in a single day than you usually work. Overtime is calculated based on the number of hours worked during a work week. Overtime means more than 40 hours in a seven day workweek. Overtime requirements apply on a workweek basis. Your workweek is a fixed and regularly recurring period of 168 hours––seven consecutive 24-hour periods. The workweek does not need to begin or end on any particular day of the week or begin at any particular hour of the day. For example, a bank might use a Monday through Sunday work week, while a retailer might use Saturday through Friday. However, it is illegal for employers to adjust the workweek in order to avoid paying employees overtime. The law prohibits averaging hours worked in a two-week period. Employers cannot take an average number of hours an employee worked in a two-week period to satisfy overtime laws, even if the standard pay period is two or more weeks. For example, if you worked 50 hours last week but only 30 hours this week (an average of 40 hours per week), your employer still has to pay you for 10 hours of overtime at time and one half for last week. Employers cannot pay a flat rate for 40 hours regardless of hours worked. It is against the law for your employer to make an agreement with you that you will only be paid for 8 hours per day or 40 hours a week regardless of how many hours you actually work. The law considers such an agreement an illegal attempt by your employer to waive the overtime requirements. However, your employer is legally allowed to prohibit overtime and to terminate workers that violate the rule. New York law also requires employers to pay you an additional one hour of pay at the standard minimum wage if you work more than 10 hours in a single workday. This 10 hour spread includes any break or meal period that occur during the workday. For example, if you reported to work at 8am, had an hour off for lunch, took two fifteen minute breaks, and left work at 6pm, you would be entitled to an extra hour of pay. This extra hour of pay does not count when you are calculating hours worked to see whether you are entitled to overtime. Salaried employees are also eligible for overtime unless they fit into one of the exceptions below. Just because you are paid a salary rather than by the hour does not mean your employer can avoid paying you overtime. However, there are a number of exemptions to the overtime rules. Some employees are exempt from the overtime rules. The rest of this article will cover a number of exemptions based on pay and job duties. Under current Department of Labor regulations, almost all employees who make $455 a week or less must receive overtime. However, New York has more generous overtime rules, which apply to employees making higher wages. Overtime rules can be confusing. Just because your employer states that you are exempt, the law may not agree. Determining exempt status is often obvious, but borderline cases can be complicated. A New York employment lawyer can help protect your rights. Direct the work of two or more full-time employees, manage other workers as your primary job duty, and have the authority to hire, fire, discipline, promote, and demote others or at least make recommendations about these decisions. If your primary duty is management, you do not lose the exemption because you also choose to perform non-exempt work, such as cooking food, stocking shelves, cleaning, etc. Similarly, if you own at least 20% of a business, you are exempt only if you are “actively engaged” in management of that business. Typically, there is only one “boss” of a department. If you only assist the manager and fill in for the manager as a supervisor only in his or her absence, you probably do not qualify for the exemption. Perform office or non-manual work directly related to business operations or management and primarily use your own discretion and judgment in your work duties as to matters of significance. The application of skills and knowledge in accordance with pre-established procedures is not considered to be the exercise of discretion and judgment. Keep in mind that just because your decisions are occasionally revised or reversed after being reviewed does not mean that you do not fall within this exemption. Do work requiring advanced knowledge––work that is predominantly intellectual, requires a prolonged course of instruction, and requires the consistent exercise of discretion and judgment, such as law, medicine, theology, accounting, actuarial computation, engineering, architecture, teaching, pharmacy, and various types of physical, chemical, and biological sciences. Unlike the federal law, New York’s professional employee exemption does not include a salary requirement. Also, doctors, lawyers, and teachers do not need to meet the minimum salary requirement to fit within this exemption even under the federal law. Despite your advanced training and/or degree, you must actually be performing professionally exempt work. For example, a CPA who is doing ordinary bookkeeping is not exempt. Perform office or non-manual work, be paid annual compensation of at least $100,000, which must include at least $455 per week paid on a salary or fee basis, and regularly perform at least one of the duties of an exempt executive, administrative, or professional employee as described above. Regularly work away from your employer’s place of business, make sales or obtain orders or contracts for services or facilities and require little or no direct supervision. Generally, outside sales do not include sales by mail, telephone, or the internet. The salary basis and salary requirements do NOT apply for the outside salesperson exemption, and employers of outside salespeople are not required to pay the minimum wage. Additionally, if you regularly work at a fixed location, including a home office, this is considered working at your employer’s place of business. Promotional work that is in conjunction with you making sales is exempt work, but if you do the promotional work and someone else makes the sale, the promotional work is probably non-exempt. While insides sales employees are typically eligible for overtime, they are exempt if they make half or more of their income from commissions. Computer employees who perform a combination of these duties are also exempt. Unlike the professional exemption, computer employees do not need to hold any particular degree or certification. The employee’s level of education is irrelevant when determining whether you fit within the computer professional exemption. Computer employees must be compensated either on a salary or fee basis at a rate of not less than $455 per week, or if compensated on an hourly basis, at a rate not less than $27.63 an hour. Some examples of computer professionals who are covered by the exemption include network or database analysts, software developers, computer programmers and software engineers. Finally, any employees working within predetermined specifications is most likely non-exempt. Several other types of workers are typically exempt from the minimum wage and overtime pay provisions of the FLSA. Salaried workers are docked for time missed due to illness. Exempt employees with academic degrees perform exclusively unprofessional, unrelated work. If you believe you have wrongly been classified as an exempt employee, and thus been denied overtime, you may have a claim. A New York employment lawyer can help you recover double damages plus penalties.